The extreme water clarity, fewer fish per mile of water, bigger and more wary fish, and self-sustaining wild trout populations all combine to provide challenges most visiting anglers have never experienced before. Why Employ a Fishing Guide? In general, your results will be greatly enhanced by employing a guide for at least a portion of your trip. The difficulties encountered in New Zealand will often baffle experienced US & UK anglers (see story ""Going Wild in the Land of the Long White Cloud) The best guides have a life time of experience in local conditions, and a great depth of knowledge that will be placed at your disposal to increase your chances of success. The best guides will not only teach you what to do, but explain why... and this will serve you well for the rest of your fishing career. Most are also competent casting instructors, and the true value of a day with a guide will often lie in all the little tricks and tips you will have learned by the end of it. You've got two choices when it comes to learning fly fishing - either spend 30-40 years figuring it out for yourself, or employ the services of a professional coach to teach you. Golfers don't hesitate to get a coach... and fly fishing is a lot more complex than golfing!!! Perhaps the real question is, why are golfers so much smarter than fly-fishermen? As a generalisation, lodges provide up-market accommodation (often luxurious) and superb meals and wines at a significant cost... For those who can afford it, you will be pampered and spoiled with great service. Helicopters will be at your beck and call, there will be room service... and no blisters! Dinner will be on time, when it suits you. Fishing will be "9 til 5" and a relaxing, pleasant, no-stress experience. This is great if you've got the wife along, fishing will be such a pleasant experience. Guide rates are often more expensive at lodges, because they (via you) are probably having to pay a US-based booking agent 20+ percent commission. Independent guides are able to be more flexible - in part because they are not concerned about inconveniencing restaurant or bar staff. They will start at daylight if necessary to avoid high water temperatures, sleep in the mid-afternoon, and then take you fishing until midnight if that's the best option ... so you usually get to fish as long or as short as you like, because most independent guides are offering you a "daily" rate and honour it. Some - like ourselves - offer home-stay or bed & breakfast type accommodation where you eat with the guide and his family. Independent guides are great if you are more concerned about the quality of the fishing than the trappings of luxury - e.g. if you are the kinda guy who'd rather fish than eat... However, us independent guides do also offer the helicopter fly-in option, plus multi-day wilderness camping trips, float trips, night fishing etc, etc. However, you will be expected to walk a little - into those hidden corners of the region, where nobody else goes and very big trout lurk in the shadows of the pools. You might even get a blister.... but you'll get to see places even the "locals" don't know about! At this point in time, there is no guide licensing regime in place in New Zealand. This appears likely to change soon, but as it stands the proposed licensing implementation will definitely not be an assurance of quality of service - a guide licence will be issued to anyone who meets very basic criteria and pays the required fees. Nor is membership of the NZ Professional Fishing Guides Association a reliable indicator of quality of service. Moreover, it is estimated that barely a third of New Zealand's practising fishing guides actually belong to the association at this point in time. Seems like every fisherman wants to be a fishing guide - new operators spring up like mushrooms every season, most last a year or two then fade away. The standard of service and experience varies greatly, from the pub/bar guide to dedicated professionals. Your best security is to insist on seeing some credentials such as references, testimonials, articles etc before making a booking, or outlaying any money. This is why we make such a big point of providing a guide profile, our address and contact details, extensive fishing information, client references, client articles, monthly fishing reports - credibility and reputation are the key to success for both guide and client. Ask for contact details of 3-5 previous clients... and call them all! I hope that when you make your first or next pilgrimage to NZ, you'll not only make the time to visit our wonderful West Coast region, but that you will also choose to come and fish with me! This unique fishing technique is the specialty of New Zealand's premier fly fishing guides! 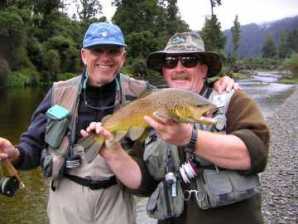 NZ fly fishing will often require you to cast further than you've ever cast before! Outline of clothing and accessories required to make the most of your NZ fishing vacation..
A list of popular flies suited to our local conditions. Drift boats are the answer to difficult bank access, and provide a safe & comfortable fly fishing platform. You can check out the West Coast's seasonal variables and conditions you might encounter at differing times of year. Brief outline of angler's access rights to NZ lake, river and stream margins. The West Coast is noted for its rain forests -and the weather plays a significant part in the day to day fishing opportunities. This page provides personal comments (and contact information) from previous guests on their experience with us. Check out what the June 2003 "Angling Report" newsletter had to say about us! Links to international fishing sites, guides, lodge, rod & reel manufacturers etc. List of the best NZ fishing books, all available online, with descriptions example pages etc.